We’re now half way along and according to the latest ultrasound the baby is a girl. So we have named her Rose Dorothy Bruggeman. Now, instead of calling the new baby “It”, or “The Baby”, we correctly call her Rose. And in our nightly prayers, the children can pray for “Mum and Rose”, or Clare can pray from “Mum and Wose”. There is a great difference between the US and Australian food tastes. For some reason, the typical US breakfast has a lot of sugar. The first time we went shopping it looked as if the cereal aisle was just full of Frosties and equivalent sugar cereals. With diligent searching we have found some less sugar enriched breakfast fare, but we have basically settled on Rolled Oats for porridge and also home created Muesli, combining the oats with raisins, shredded coconut, and other dried fruits. This leads to other things we miss – sultanas and desiccated coconut. It could be just a regional thing, but it seems as though sultanas are not available although we can get Raisins and “Golden Raisins” which are similar. Also, coconut is primarily available as “sweetened” coconut. That is, about a content of 1/3rd liquid sugar is mixed with the coconut. The local homeschooling group had an International night, and not surprisingly we represented Australia. Each group had to provide some sample food from the represented country and after all had tasted the food, gave a talk. Our sample foods were Lamingtons, Anzac Biscuits (cookies), Vegemite on Toast and some of Lana’s Rice Salad. Other than the rice salad, none of our choices could be made with local ingredients. Lamingtons require desiccated coconut for coating, Anzac Biscuits require Golden Syrup and Vegemite on toast requires Vegemite. Actually, we were able to get small tins of Golden Syrup at the local supermarket. All of our food went quickly and there was some surprise that Vegemite was made by Kraft. Our talk on Australia focused firstly on the primary difference between the two countries – water. We had a large wall map that had an overlay of the US comparing the size of the two countries. Excluding Alaska, the US is the same size as Australia. However, Australia has this huge desert in the middle. I also pointed out where the bulk of the population lived and everyone found the information new and interesting. One of the other talks was on Greece. David asked her a question, “What is the 3rd largest Greek populated city in the world?” The girl didn’t know, so David pointed to our map and answered, “Melbourne.” Based on Greek descent, Melbourne has the third largest population in the world. Whilst training new Chicago dealers in Denver, David was introduced to what he was told were the best doughnuts in the world. “Krispy Kreme Donuts”. 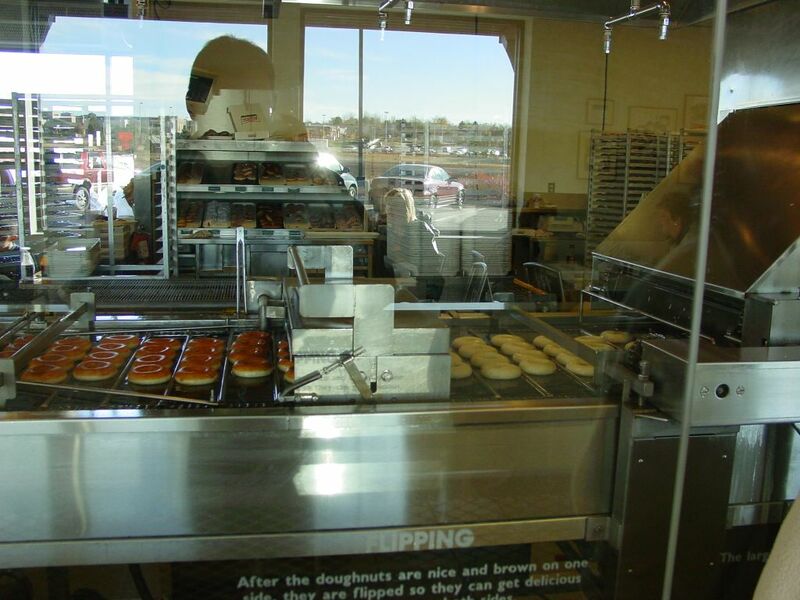 Basically, this company makes millions of donuts everyday and people go through the drive through to get hot and fresh doughnuts. They are basically soft doughnuts that are then covered in a thin icing. 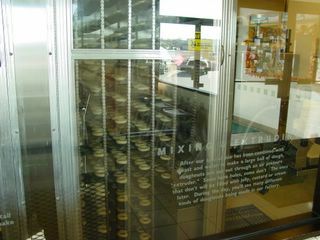 Most supermarkets will have their own icing covered doughnuts as well as boxes of “Krispy Kreme Donuts” as well. Whilst in Denver, David went with Zoe White from Star’s Melbourne office and they visited the local “Krispy Kreme” store. Mixing and Extruding: After our special mix has been combined with yeast and water to make a large ball of dough, doughnuts are cut out through an air pressure extruder. Some have holes, sone dont. The ones that dont will be filled with jelly, custard or cream later. Note: All the doughnuts are icing coated. 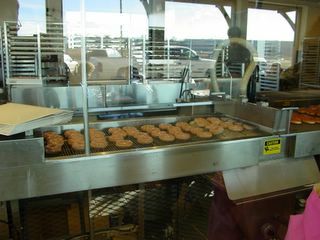 Rising and flipping: After the doughnuts are nice and brown on one side they are flipped so they can get delicious on both sides Note: Notice how many are being made at one time. They still run out. And we understand that this store is just producing for local consumption. Supermarkets are supplied from main production factories. Sugar: Now the machine has the doughnuts go through a waterfall of liquid icing sugar. Once they get to the end, the staff use long wooden skewers to pick up the doughnuts and put them into dozen lots and move them out of the store as fast as possible. The locals were partly right. The doughnuts are very tasty, and when you get them fresh, they just squish down in your mouth, but, boy, they sure are sweet. The local 4H club sponsors a “BB Gun Competition”. Now for some explanation of what all this means. The 4H organization is a youth organization aligned with the local agricultural colleges, primarily aimed at country youth. The 4H stands for Head, Heart, Hands and Health. They arrange courses and clubs in areas such as horse riding, archery, gun safety and lots of other outdoor activities. Volunteers do most of the organizing and the work is great. As we mentioned last month, BB guns are air rifles that fire ball bearings. These guns are available in many department stores and are recommended for Children 10 and older. 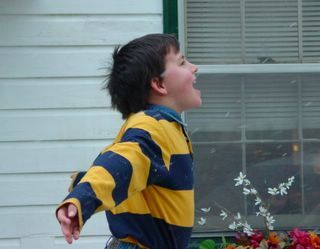 The BB Gun competition involves practicing every Wednesday and Thusday afternoons 3:30 to 6:00pm. Then in June there is the District championships and if they end up in the top somewhere they go to the State championships. However, there is only room for 14 children from 9 to 15 years old. There are 24 or so trying out. So far after two weeks of practicing and learning, Ariel and Eric are both going well. Next week will be the final tryout week when the instructors will call all of the children letting them know who has succeeded. Next issue we will be able to tell you if they get in. David will be going back to Australia to help out one of his long time clients. He has been helping this client since he first moved to Sydney in 1993 and as they are now moving onto Greentree Accounting Software, they wanted David to assist. This means that he will be able to come back with lots of things we can’t get here, such as Chocolate, the slip on boots the children wear known by the brand name “Blunderstones”, Vegemite, coconut, passion fruit pulp, and whatever is on the list Lana and the children are compiling.